Dry eye syndrome is a chronic and usually progressive condition. In most cases, dry eyes can be treated successfully, which results in considerably greater eye comfort, fewer dryness symptoms, sometimes even resulting in better vision. Women are more likely to suffer from dry eye syndrome and it tends to become more common after a certain age. It is estimated that more than 15% of people aged 55+ have some form of dry eye syndrome. Dry eyes are caused by the lack of adequate tears. Tears are mainly made up of water, but also other inorganic substances such as sodium chloride, sodium carbonate, magnesium carbonate, and calcium. They also contain proteins and carbohydrates. For some people, dry eye syndrome is caused by reduced tear production. For others, it may be caused by increased tear evaporation and imbalance in its composition. mucus layer – covers the surface of the cornea. 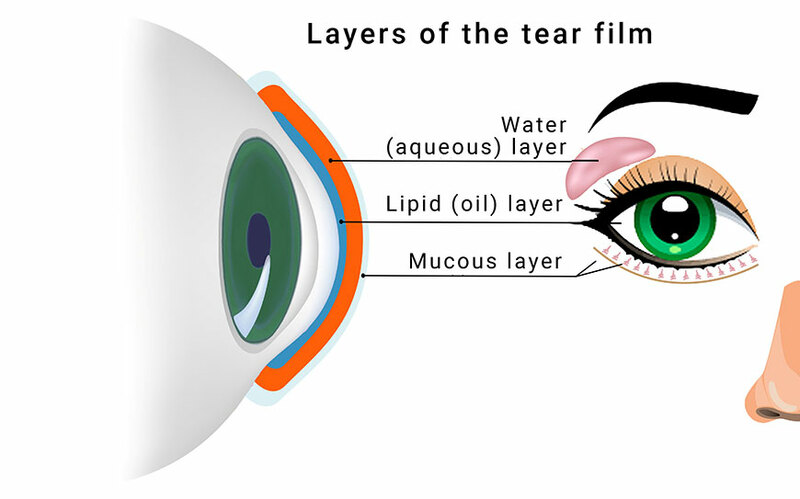 The lipid (oil) layer forms the outermost surface of the tear film and is produced by the meibomian glands. Its main function is to prevent the intraocular fluid from evaporating. In addition, it also prevents tears from dripping out of the eye by stabilizing the tear film. The aqueous layer forms most of what we usually perceive as tears. It is produced by the tear glands and It supplies the corneal epithelium with nutrients and atmospheric oxygen. It also has an antibacterial effect and cleans the eye surface by washing out accumulated particles and bacteria. The innermost layer of the tear film consists of mucus that is produced by the conjunctiva. It reduces significantly the pressure on the eye surface. It also allows easy and even spreading of the water layer on the cornea, which is important for the sharpness of vision. Blurred vision or tired eyes. It's common for many lens wearers to experience the symptoms of the dry eye syndrome but luckily, there are effective remedies for managing this condition. Find the common causes and ways to relieve the dry eyes when wearing lenses in our article. Tear production tends to decrease with age. Dry eyes are more common in people over 50 years of age. Lack of tears is more common in women, especially if they experience hormonal changes due to pregnancy, using contraceptive pills or menopause. If you have dry eyes you should pay attention to situations that are most likely to cause its symptoms. Then find ways to avoid these situations to prevent the symptoms of dry eyes. Avoid blowing air directly into your eyes. Do not direct air conditioners or fans to them. Consider wearing sunglasses or other safety glasses to block wind and dry air. Take regular breaks during long tasks. If you are reading or doing another task requiring visual concentration, take your eyes periodically off the screen. Close your eyes for a few minutes or blink intensively for a few seconds to help spread the tears evenly over your eyes. The air in the mountains, in the desert, or in a room with air conditioning, for example, can be extremely dry. When you spend your time in such an environment, it may be useful to close your eyes for a few minutes to minimize the evaporation of your tears and you might have to repeat this action periodically. Always position your computer screen below eye level. If the screen of your computer is higher, you will need to open your eyes wider. Position the computer screen below eye level and this may help to reduce tear evaporation. Avoid smoking. If you smoke, ask your doctor for help you develop a no-smoking strategy that may work for you. If you do not smoke, stay away from the people who do, when they're smoking. Regularly use artificial tears. If you have chronic dry eyes, use eye drops even when your eyes feel relatively good, to keep them moisturized. Do you think you are suffering from dry eye syndrome? Take a test! If you think you might be suffering from dry eye syndrome, you should consult an ophthalmologist who can perform the necessary tests to diagnose the syndrome and eventually determine the degree of the disease. There is a test you can do yourself before you visit your ophthalmologist. This is a simple indicator, called SBUT. The Symptomatic Tear Time Test determines whether you are suffering from dry eye syndrome. Take a stopwatch or a clock. Blink twice, then start looking straight ahead, making sure you start the countdown immediately after the second blink. Avoid blinking as long as possible. SBUT is the time period (in seconds) that runs between the last full blink and the moment the eye experiences discomfort. If your SBUT is 5 seconds or less, it is possible that you have dry eye, as the tears in your eyes evaporate too quickly, leaving the eye surface unprotected. Take a look at all eye drops!